The Angel, Islington is an historic landmark and a series of buildings that have stood on the corner of Islington High Street and Pentonville Road in Islington, London, England. The site of the Angel Inn from the 16th century, on lands belonging to the Clerkenwell Priory, it was rebuilt many times and the site was bisected by the New Road in 1756. 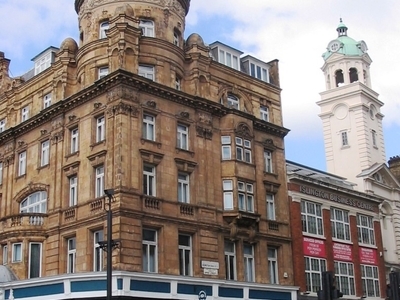 It gave its name to Angel Tube Station, opened in 1901, and the surrounding Angel area of London. The current structure was completed in 1899 and was known as the Angel Hotel. The building was acquired by J. Lyons and Co. in 1921 and was used as the Angel Cafe Restaurant. In 1935 it was chosen as a property for the British version of Monopoly. The building was sold to the London County Council in 1959 to be demolished as part of plans for road improvement works that did not take place. It was returned to private ownership, renovated from 1979 and reopened in 1982 as the Angel Corner House. It is currently used as offices and a branch of The Co-operative Bank, and is a grade II listed building. In 1998 a new pub called The Angel, operated by J D Wetherspoon, opened adjacent to the building. Here's the our members favorite photos of "Landmarks near London Borough of Islington". Upload your photo of The Angel!